Were they that wrong? The final RealClearPolitics polling average had Clinton at +3.2 (46.8% to 43.6%). I’ve also been watching the aggregation of all non-partisan telephone polls. This ended at Clinton +2.0 (45.8% to 43.8%). As of now, Clinton has won 47.7% of the national vote with 47.5% going to Donald Trump. So the result is likely something like Clinton +0.2. Even with aggregation, polls have margins of error and we once again had a contest where the margin of victory is smaller than the margins of error of the data examined. In that regard, the polls were not “off” or “wrong.” In fact they were similar in accuracy to previous elections. At the state level, there were some harder to predict states. My final election map prediction that I showed to my Georgetown classes on Monday were wrong on Pennsylvania, Wisconsin, and Michigan. The Pennsylvania polling average had estimated a Clinton lead of +1.1. But the last survey in the state had Trump ahead by +1 percentage point. In the end Trump won the state by +1.1. Again, the polls were not really wrong or off here. I was. I chose history over the most recent data. In Michigan the polls had Clinton leading by a +3.4 average. But here again, the last poll had Trump ahead by +2. The polls were not off here either. I was. Where the polls were clearly “wrong” was Wisconsin. The state average was +6.5 for Clinton. Trump won the state by +1. At the same time this state has a Republican Governor and is home to the Republican Speaker of the House. A Trump win here was clearly possible, even with the polling trend, but it did not seem likely given the available data. I encourage everyone to take a look at the news they watch and read. Is it really the news or political entertainment? Cable television news is mostly the latter. Journalists and pundits may have wanted to say Clinton was going to win easily but that did not mean reality had to play along. When Silver pointed out data and analyses that provided some doubts about conventional wisdom this did not make him biased. He was being a realist. An objective analyst. We used to respect and desire that. Now we seem to more often want to watch and read news that tells us “our side is winning” and what we want to hear and believe. In the end reality interjects. 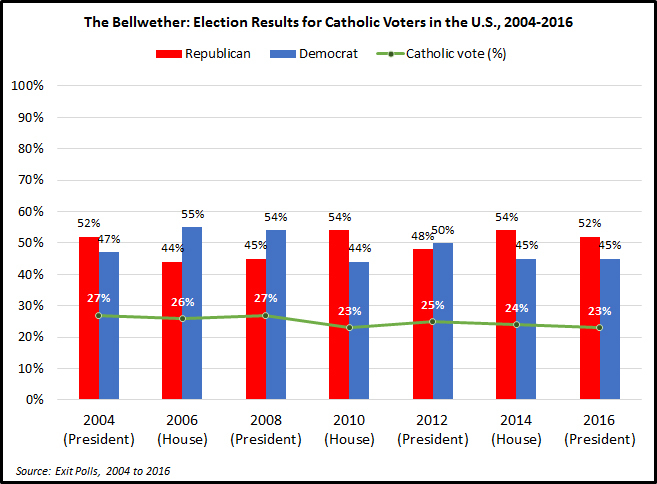 The Catholic vote, or the religion factor more generally, was largely ignored by the media and pundits this year. There was some attention to Evangelicals in the Republican primaries. Later Catholicism became a focus briefly when polls came out showing that Trump had a “Catholic problem” (1, 2, 3) Apparently, in the end, the problem was overstated. He won the Catholic vote 52% to Clinton’s 45% with 3% going to other candidates. Catholics made up 23% of the electorate. In recent elections, if candidates win the Catholic vote they typically win the election. Trump won Catholic majorities in Michigan (57%), Florida (54%), and Ohio (56%). Clinton won the Catholic vote in California (63%) and Nevada (55%). It appears only Catholics make swings nationally back and forth from Republican to Democrat. Other Christians vote consistently Republican. 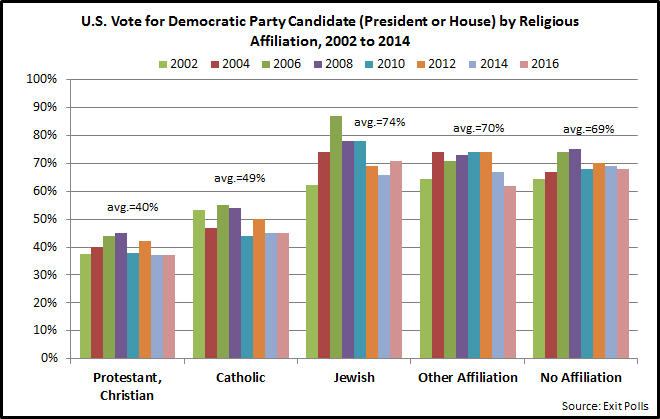 Those of non-Christian affiliations or no affiliation vote consistently Democrat. That leaves Catholics often as an important deciding factor. I think it will take some time and more research to understand why Catholics were more likely to vote for Trump than Clinton. It is also the case that more data will be released with the American National Election Study (ANES) which may alter our view of the Catholic vote (it has in the past). As I have explained above, if there was a ghost in that machine it probably only manifested itself in Wisconsin. It will take more time and research to understand how the polls were so off there. For now, I think it can take its place alongside Ohio in 2004 and Florida in 2000 as a state to examine more closely. For political scientists the electoral map is getting very interesting. It is possible that 2016 is the beginning of a realignment. Democrats are showing new strength in the Sunbelt South. As demography changes this may turn some red states like Georgia, Texas, and Florida purple and eventually blue. At the same time Democrats may be losing ground in the Rust Belt North to Republicans where pink and red states could be more common. Note: As always I was a non-participant in the election. I am not a partisan and not registered to vote. As a former reporter and now social scientist I really believe in trying to be objective.